Daisy Ridley admitted she didn't think her performance as Rey in 'Star Wars: The Force Awakens' was very "good"
Daisy Ridley didn't think her performance was very "good" in 'Star Wars: The Force Awakens'. 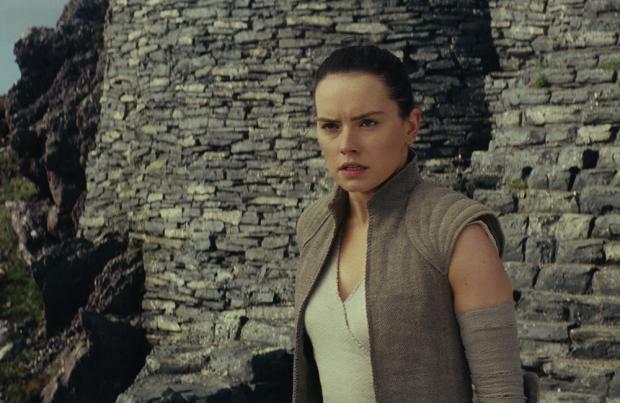 The 25-year-old actress made her debut as the Force-sensitive orphan Rey in the seventh film in the sci-fi franchise and she reprises her role this December in 'The Last Jedi', but when she watched the movie back she was disappointed with her acting. In an interview with the December issue of ELLE magazine, she said: "I didn't think I was good in the first film, and I was struggling with that. I did the first one because I didn't really know what I was getting myself into and I was having loads of fun, and suddenly I'm realising what this actually is. I realised I can't f***ing do this. I'm highly dramatic." Ridley is set to reprise her role as Rey in 'The Last Jedi' this year alongside Adam Driver (Kylo Ren), John Boyega (Finn), Mark Hamill (Luke Skywalker), Oscar Isaac (Poe), Lupita Nyong'o (Maz Kanata), Gwendoline Christie (Captain Phasma), Anthony Daniels (C-3PO), Andy Serkis (Snoke), Domhnall Gleeson (General Lux) and the late Carrie Fisher as General Leia. This isn't the first time Ridley has been critical of her own acting abilities. She recently admitted she had doubts about whether she could hold her own in the star-studded Sir Kenneth Branagh-helmed movie 'Murder on the Orient Express' which also features Johnny Depp, Willem Dafoe, Michelle Pfeiffer, Derek Jacobi, Penelope Cruz and Josh Gad. Speaking at the world premiere of the movie at The Royal Albert Hall, in London, Ridley said: "It was amazing and what was more amazing was that everyone was absolutely lovely. I did feel really part of something. There were points I was like, 'There's no way I was going to get this job, I'm not good enough yardy yardy ya. "And then when you get to a point where everyone's made you feel so welcome it's just unbeatable." Ridley stars as Mary Debenham in the new movie which sees Belgian detective Hercule Poirot (Branagh) have to solve a murder on the European train trip after one passenger is stabbed to death.